Irish Watercolour Painter: Biography, Fine Art Illustrations, Paintings. One of the important Irish artists of the nineteenth century, the painter James Mahoney (also Mahony) was a noted (and widely travelled) watercolourist, illustrator and sketcher, who among other things helped to pictorialize the tragedy of the Great Famine in Ireland (1846-51). Born in Cork, the son of a joiner, Mahoney's early years are not well documented. Art historians believe that he studied drawing and painting in Rome, and went on to spend several years in Italy and France before returning to his native city at the age of 32. Achieving rapid fame for his fine watercolour painting, he exhibited a number of townscapes at the Royal Hibernian Academy (1842-6), including views of Rome, Venice, Paris and Rouen. 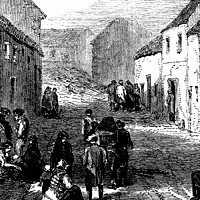 Not long afterwards, he was hired by the Illustrated London News to visit the worst centres of famine in County Cork, and it was the engravings of Mahony's sketches from Clonakilty and Skibbereen in West Cork that helped to bring public opinion to bear on the British government to take action. Mahoney's role in this tragedy is similar to that of his fellow Corkman - the shortlived artist Daniel MacDonald (1821-53) - whose painting The Irish Peasant Family Discovering the Blight of Their Store also drew attention to the widespread starvation in Ireland during the late 1840s. In 1856, following the success of the Irish Industrial Exhibition on the lawns of Leinster House in Dublin (1853) when Mahoney completed his outstanding and detailed work The Visit by Queen Victoria and Prince Albert to the Fine Art Hall of the Irish Industrial Exhibition, Mahoney was elected an Associate of the Royal Hibernian Academy where he continued showing intermittently until 1859, when he moved to London. He exhibited numerous watercolours at the Royal Academy (1866-77), while also renewing his acquaintance with the Illustrated London News as a draughtsman and illustrator. His illustrations also appeared in several other London journals and newspapers of the day, as well as the 'Household Edition' of Charles Dickens' works. He died of apoplexy in London at the age of 69. The auction record for a work by James Mahoney was set in 2004, when his painting, entitled A Smoke on the Sly, was sold at James Adams, in Dublin, for €6,700.  For the development of Irish watercolours, see History of Irish Art.  For more details of painters in Ireland, see: Homepage.